See the sights, tastes, cultures and beauty of Vietnam on this mind blowing 18 day tour, making your way through buzzing city centres, emerald seascapes, rice paddy fields and stunning white sandy beaches. 15 Nights of Hotel Accommodation Including Daily Breakfast, Plus An Overnight Halong Bay Cruise! Uncover the diverse beauty of Vietnam. 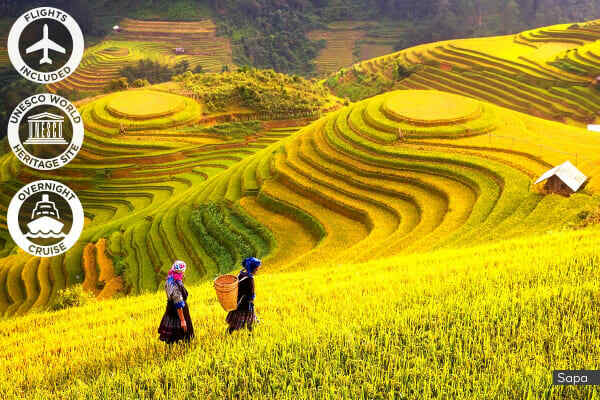 Hidden narrow alleys, towering ancient pagodas, limestone seascapes and local villages abundant with rice paddies; discover the best that Vietnam has on offer on this breathtaking 18 day trip. Adventure through the gorgeous Sapa Valley. Wander through postcard-worthy rice paddies, quaint local villages and uncover the day-to-day lives and traditions of the native Hmong people. 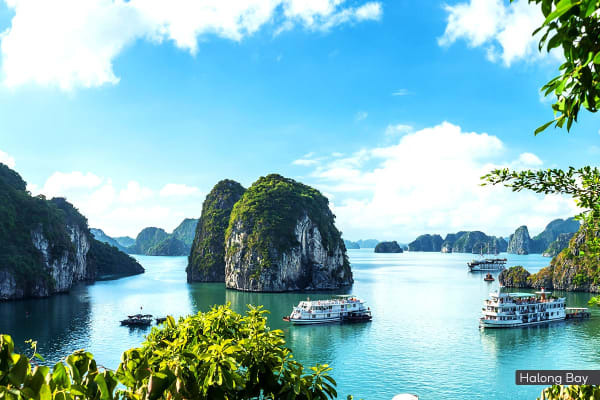 Cruise the expansive beauty of Ha Long Bay on a junk boat adventure through uninhabited caves, emerald landscapes and hidden grottoes on an overnight cruise. Get lost in the riverside beauty and incredible preserved ancient architecture of Hoi An, adorned with Chinese and Japanese detail that will make you feel as if you were walking through a quaint 16th century port town. Explore the historic marvels of Ho Chi Minh City, gaining insight into the Vietnam War at the War Remnants Museum and Reunification Palace, and gape in awe at the grandeur of the Saigon Post Office and Notre Dame Cathedral. Sit back, relax and recharge on the white sandy beaches and crystalline shorelines of Phu Quoc Island, treating the senses to stunning sunsets, fresh seafood dinners and snorkelling adventures (own expense). Xin Chao Vietnam! Upon arrival in Hanoi you’ll be met by a tour representative at the airport and transferred to the hotel for check-in. Some flights might depart one day earlier. Transfer early this morning to Sapa. After checking in to your hotel, enjoy a light trek to Cat Cat Village, perhaps sampling Apple Wine, a fine local delicacy of the village. Drive southwards towards Den Thang Mountain this morning. Take a light stroll to Hang Da, a Black Hmong village steeped in age-old traditions, cultures and lifestyle of the Hmong people. Follow the village path downhill to the stunning valley of Sa Seng, passing through small Hmong hamlets (villages) en-route. Your walk ends in Sa Pa, a Hmong hamlet located close to the former Sapa market. Depart for Hanoi after breakfast this morning. Upon arrival, check in to your hotel and spend the rest of the afternoon at your leisure. Perhaps weave your way through the narrow alleyways of the Old Quarter and watch the famous street train zoom past you! Take a guided tour through the key landmarks of the city today, starting at Hoa Lo Prison, known as ‘Hanoi Hilton’ during the American War and famous for incarcerating American Senator John McCain during the war. Continue onto Vietnam’s first university, the Temple of Literature, then the West Lake and Tran Quoc Temple. After lunch, visit Ba Dinh Square, the sight of Vietnam’s declaration of Independence. Pay homage to ‘Uncle Ho’ at Ho Chi Minh’s Mausoleum, followed by Ho Chi Minh House and the One Pillar Pagoda. Bus back through the 36 Meandering Streets of Hanoi’s Old Quarter. Water puppet show and Hanoi foodie tour (AUD $65 per person). Travel to Halong Bay this morning to board your Halong Bay junkboat, sailing through the thousands of breathtaking limestone islands and caves. Passing by sampans gliding across the emerald waters of the bay, you’ll even get the chance to visit some of the hidden grottoes that lay beneath the towering cliffs. Savour a fresh seafood lunch and dinner aboard the junk. Enjoy the emerald waters of the bay at its best as you cruise through the spectacular limestone formations. Disembark around noon and transfer to Hanoi for your flight to Danang. Upon arrival in Danang, travel to Hoi An, a melting pot of Japanese merchant houses, Chinese tea houses, street food hubs and Venicelike canals. In the event that sufficient seats are not available for the Hanoi to Danang flight, the group will instead fly from Hai Phong. Enjoy a guided tour of Hoi An today, weaving through the narrow streets of this charming town, buried in ancient architecture that will make you feel as if you were walking through a 16th-century port town. Once known as Faifo, Hoi An was a pivotal port along the famous Silk Road, with influences from China, Japan, France and Portugal contributing to the heritage, look and cuisine of the city. Half-day cycling tour from Hoi An to Tra Que Village (AUD $45 per person). Fishing village and waterway eco-tour (AUD $110 per person). Visit the Rehahn Museum this morning, home to the Precious Heritage Collection created by the French photographer, Rehahn. The collection focuses on the endangered cultural heritage of the 54 Vietnamese ethnic minority groups, documenting their rapidly-changing ways of life in the modern era. Spend the rest of the afternoon at your leisure, perhaps experiencing the hustle and bustle of the Hoi An market, fragrant with aromatic herbs and spices. Lune Performing Centre Hoi An Show or Hoi An Memories Show – enjoy a traditional Hoi An-inspired performance, capped off with a light snack and cocktail (AUD $105 per person). Head for Hue today, stopping off at the picturesque Lang Co Beach en-route. Once the political, economic and cultural capital of Vietnam, there’s plenty to see in your free time this morning! Enjoy a boat ride to Thien Mu Pagoda, perched along the banks of Perfume River. Transfer back to the city and head for Khing Thanh Citadel, comprised of the Imperial City and ancient lakes and gardens, laid out in concentric circles. Royal Dinner in Hue (AUD $95 per person). Transfer to the airport to board your flight to Ho Chi Minh City. Upon arrival, visit to Dong Khoi Street before heading to the Notre Dame Cathedral and the Saigon Post Office. Continue onto the Reunification palace, the former palace of the presidents of South Vietnam and the War Remnants Museum where you can gain insight into life during the American War. Cap off the day with a visit to Ben Thanh Market before returning to the hotel. Head for a scenic drive through the Mekong Delta, arriving in My Tho where you’ll cruise past local fishing villages and islands via boat. Sail through the small canal of Vam Xep and experience local life in Ben Tre Province (Coconut Village) before continuing onto Quoi to learn about bee farming, local crafts and coconut wood while sipping on honey tea! Visit fruit orchards riding on a horse cart and enjoy seasonal tropical fruits before transferring to a village specialising in coconut candy. Cap off your day with a rice paper workshop on Phoenix Island. Return by boat to My Tho and then back to Ho Chi Minh City. Drive to the outskirts of the city this morning to the Cu Chi Tunnels where you’ll be able to gain insight into the life of a tunnel-dwelling soldier during the Vietnam War. Continue to a lacquerware factory en-route back to the city, then enjoy the rest of the day at your leisure. Lunch at Hoi An Sense Restaurant (AUD $40 per person). Dinner Cruise on Saigon River (AUD $60 per person). Take a short flight to Phu Quoc Island, located off the gulf of the coast of Cambodia and Vietnam. 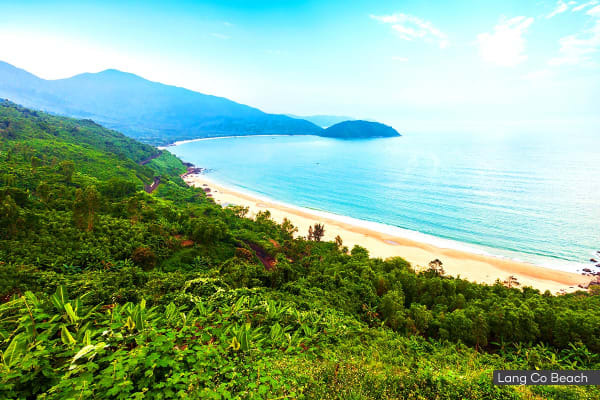 Abundant with white sandy beaches and crystal clear waters, this island is the perfect place to unwind and recharge from your jam-packed Vietnamese adventure. Upon arrival, you’ll be transferred to your hotel for check-in where you can spend the afternoon at your leisure. Sunset barbeque and squid fishing cruise – watch the sunset over the island as you set sail for squid fishing, followed by a barbeque dinner (AUD $80 per person). Take the day to explore the rugged jungle, white sands and sparkling cobalt waters of the island at your leisure. Full Day Tour, East and South Phu Quoc Island (L) – Delve into the key landmarks of the island, visiting a pearl farm, An Thai Port, seafood market, Phu Quoc Prison Museum, lunch at the stunning Sao Beach and more! (AUD $120 per person). Spend the day unwinding at the resort or lazing away on the beach, perhaps going for a snorkel or rejuvenating ocean dip! Discover Vinpearl Land Amusement Park and Safari Park – visit world-class theme parks abundant with thrilling rides, activities, games and stunning wildlife (AUD $90 per person). Optional meal package – taste renowned Vietnamese cuisine at Vinpearl land, cooked up by 5 star chefs (AUD $80 per person). Say goodbye to your island paradise as you transfer to the airport for your connecting flight from Ho Chi Minh home to Australia.